Describes the qualities of a good friend and discusses activities and communication problems involved in friendship. Introduces the concept of shyness and offers suggestions on how to deal with it. When do people feel shy? 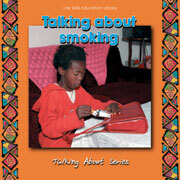 Discusses the dangers of smoking and ways to avoid starting this unhealthy habit. What’s so bad about smoking? Discusses cheating,why people may cheat, and how to win without cheating. Offers basic advice on how to deal with parents' divorce, including coping with feelings. A simple introduction to different drugs and how they affect the body and to the problem of drug abuse. Explains what alcohol is, who may drink it, and how it affects the brain, the body and the personality. Discusses how to deal with peer pressure to drink and related matters. How does alcohol affect people? Provides advice on surviving the death of a parent and suggests what feelings and behaviour to expect from others. Explains what adoption is,why a parent might put a child up for adoption, and what is special about being adopted.